Violin is one of the most popular instruments within the string group. Manufacturing of violins requires very precise craftsmanship. 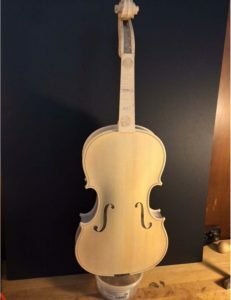 Selection of different types of wood species for different parts, aging of wood, using natural glues and ingredients in the varnish are some of the main aspects of producing a good violin. This fact sheet summarizes fundamentals to manufacture a well-designed violin from the point of wood technology. Violin is originated from “violo,” the Italian meaning “small viol.” It is believed violin is based on Ravanathatha, which is an ancient Indian string instrument introduced to Italy by Arab traders during the early 11th century. 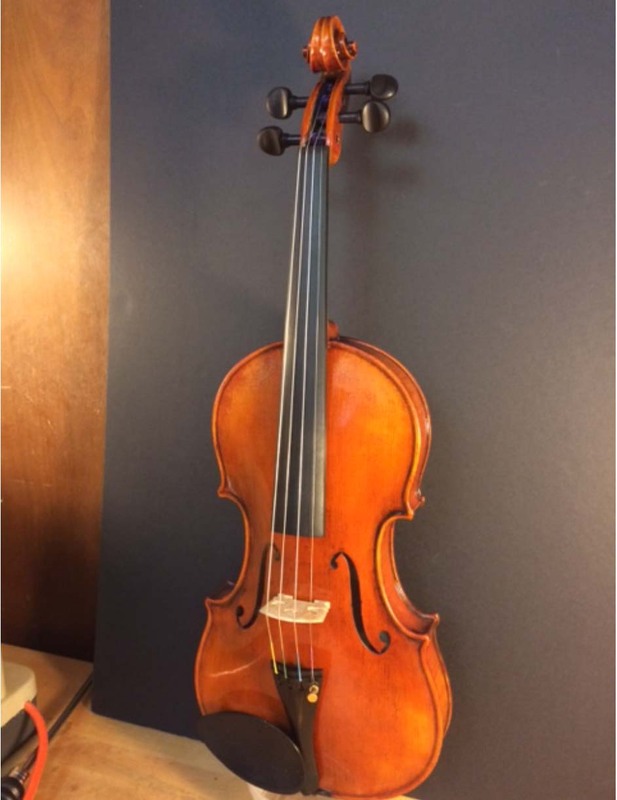 The violin known with today’s configuration was developed in the 16th century in Italy and took some more modifications during the 17th and 18th centuries. The first true violins were manufactured by Andrea Amati in Cremona, Italy, in the 15th century. During the next 160 years or so, other famous violin-maker families, including Antonio Stradivari, Giuseppe Guarneri and several others, put the violin on a high level in terms of its acoustical performance and artwork. Violin manufacturing requires many hours of craftsmanship. In general, a typical violin maker or luthier can produce five to six violins within a year. Selection of wood and wood species is the main parameter influencing overall quality of a violin and eventually its sound. As known, wood being porous and hygroscopic material, needs to be dried to reduce its moisture content for an effective use for a final product. In the case of indoor or outdoor utilization of the wood, lumber can be dried using kiln to a target a moisture content ranging from 20 to 5 percent. Kiln drying of wood also modifies structure of cells, which enhance overall physical and mechanical properties of the product without having any adverse effect as it is targeted to be used for general purposes. However, in the case of musical instruments, including violin, raw material should not be kiln dried to eliminate the effect of the drying process on the anatomical structure of the wood, which immensely influences acoustical properties of the finished instrument. 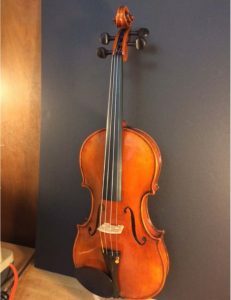 Therefore, conditioning wood parts for a long period of time, ranging from several years to 10 years to even 50 years, in room conditions is a vital part of violin making. The most commonly used wood species for violin manufacture are spruce, willow, maple, ebony and rosewood. In general, maple is used for back plate, rib, neck and scroll, while spruce is an ideal wood for the front plate of a violin. Matching quarter sawn spruce such as European spruce (Picea abies) or Engelman spruce (Picea engelmannii) are the most widely used species for the front plate of a violin. Figure 1 illustrates flat sawn and quarter sawn boards. The front plate is probably the most important part of the violin, influencing overall sound quality. Spruce has unique acoustic characteristics with uniform grain orientation. Most of the violin makers would like to have wood harvested from old growth trees in high altitudes. Famous 17th century luthier Stradivarius used Alpine spruce, which has grown during the time of extreme cold weather, resulting in condense annual rings close together. This makes wood denser and enhances its mechanical properties. Once the tree is harvested, wood is split into two sections to prevent possible cracks reducing its strength. In general, planks or billets are sealed at the ends using wax or resin to reduce sudden moisture content change. Of course, two billets will never be identical to each other even if they are cut from the same part of one tree. A typical front plate of a violin is manufactured from two pieces of spruce glued together. Narrow annual growth rings with uniform grain orientation is desired for a good quality acoustical performance. It is very important to finish wood surfaces with scrapers, which results in a sharp appearance of the wood. Sandpaper is rarely used in violin making. Figure 1. Flat sawn and quarter sawn boards. The sound heard from a violin is the result of air vibrating and released out of “f” holes in the instrument. Therefore, the wood of the instrument should be light and resonant. On the other hand, if wood is too light and weak, it will not resist the tension of four strings and easily collapse. Innate mechanical properties of wood in a violin can change with time and exposure conditions. Drying of wood can reduce its density, resulting in variation of acoustical behavior. It is evident there is a comprehensive engineering and art aspects of building a well-designed violin. Fingerboard and pegs require high density durable wood species; therefore, ebony, rosewood and boxwood are widely used for those parts. Ebony is a very dense wood from tropical species belonging to the Dispyros family of trees. There are different ebony species, namely Macassar ebony (Diospyros celebia) from Southeast Asia and Gaboon ebony or African ebony (Disopyros crassiflora). Macassar ebony has average modulus of elasticity and Janka hardness values of 2,515,000 psi and 3,330 pounds, respectively. Having an average density of 1.12 g/cm3 makes this species an ideal material for fingerboard, tail piece and pegs of the violin. Rosewood also is used for tail pieces and pegs of a violin. Rosewood is a general name for hard reddish dark color wood from several species of tropical leguminous trees such as Brazilian rosewood (Delbergia nigra), which is widely used for making fingerboard and pegs. It has density and modulus of elasticity of 0.835 g/cm3 and 2,000,000 psi, respectively. 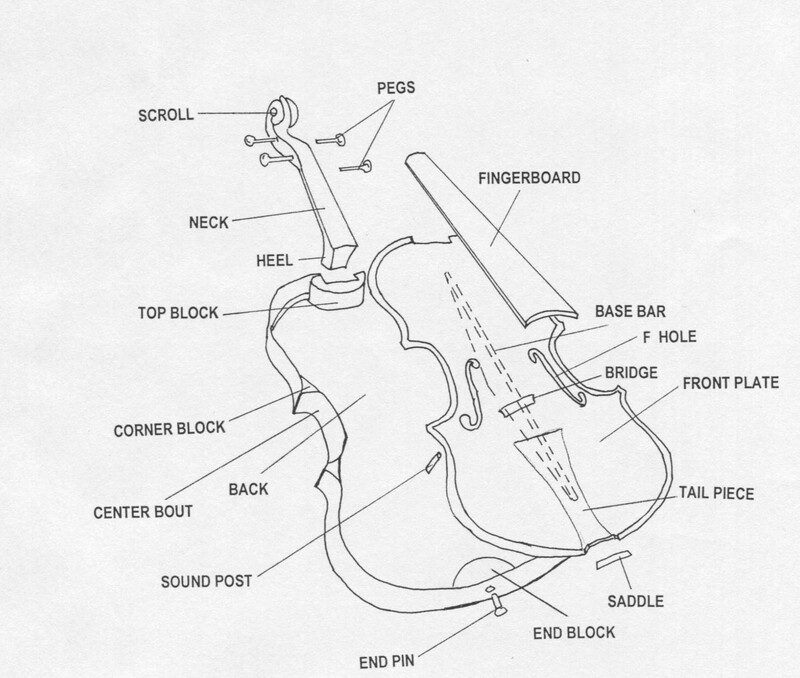 Figure 2 illustrates schematics of a typical violin and its parts. Figure 2. 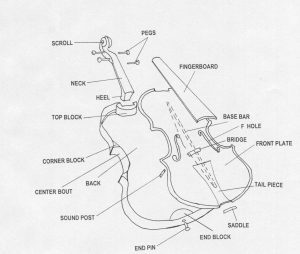 Schematic of a typical violin and its parts. Varnish also is a very important factor influencing overall sound quality of a violin. For example, it was found that a combination of gum Arabic from trees, salt of copper and iron, along with other organic compounds were used to finish famous Stradivarius violins. It is claimed having some metal in the varnish also gives special acoustic effect to the violin. The bow is the part of the violin that causes vibration and is manufactured from exotic species, most commonly Brazilwood (Caesalpinia echinata) with a density of 0.98 g/cm3. It has dark red color wood, which easily can be varnished. Bundle of horsehair is the prime material for the bow, creating excellent friction on the strings. According to the Federation of Violin Makers, there are around 170 violin makers in the United States and Canada. Many of them produce world-class violins for famous orchestras and concert violinists. 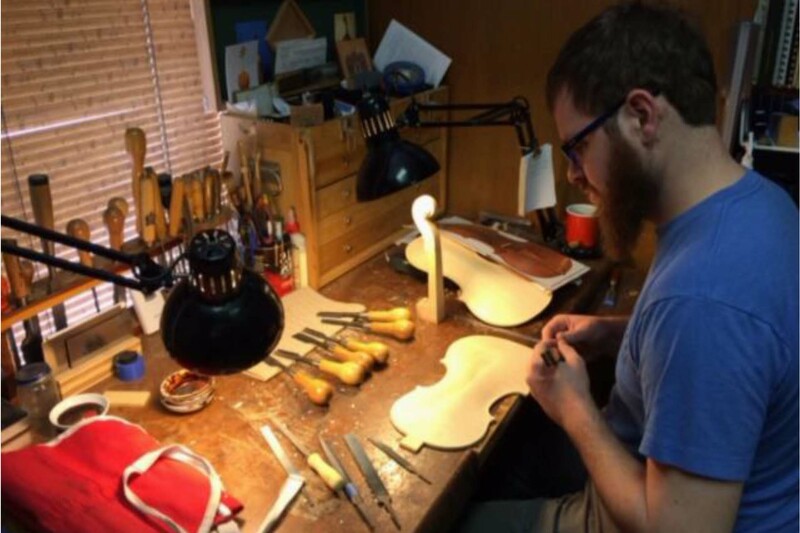 There also is one violin maker in Oklahoma, owned by Arsenios Corbishley who has a degree in cello performance. He produces violins and restores other string instruments, including cello and doublebase, in his studio located in downtown Oklahoma City. Figures 3, 4 and 5 illustrate semi-finished, finished violins and the studio of Corbishley Violins. Figure 5. Studio of Corbishley Violins. Further information on wood species used in violin making can be found in the following literature. Heron-Allen, E. 2013. Violin Making, A Historical and Practical Guide. Courier Corp.
Ossman, B. 2009. Violin Making. Fox Chapel Publishing. Darnton, M. 2015. Violin Maker. Darnton and Hersh Fine Violins. Barker, J. 2001. Violin-Making, A Practical Guide. The Crowood Press Ltd.
Marchese, J. 2008. Violin Making. Harper Collins Publishers.